Rose Valenta is giving away a paperback copy of her humor book, Sitting on Cold Porcelain. Allan Leverone is giving away an e-copy of his thriller, Final Vector, and 6 e-copies of Postcards from the Apocalypse. Frank Edwards is giving away a paperback copy of his medical thriller, Final Mercy and a paperback copy of his poetry and short story book, It’ll Ease the Pain. Pamela Samuels Young will be giving away a paperback copy of her legal thriller, Murder on the Down Low, and a copy of her audio CD, How to Write a Novel Despite Your Day Job. Sheila Hendrix will be giving away both a paperback copy and e-book copy of her YA paranormal, The Betrayal. Cynthia Kocialski will be giving away a paperback copy of her startup business book, Startup from the Ground Up. C.W. Gortner will be giving away a paperback copy of his historical mystery, The Tudor Secret. Vincent Zandri will be giving away 2 autographed copies of his thriller, Moonlight Falls & 2 autographed copies of his thriller, The Remains! Jeanne C. Davis will be giving away a paperback copy of her psychological mystery, Sheetrock Angel! Frank Scully will be giving away an e-copy of his mystery novel, Resurrection Garden! To find out the details, visit our Facebook Party page here! Becky Due is becoming the new voice of women’s fiction. She has the courage, honesty and writing style for today’s busy women, and she does not cringe away from hard issues. She will leave you feeling strong, self-confident, independent, and in control of your life. She has a way of sucking you into the story and changing your life with her fast-paced novels you won’t want to put down. Her novels are not the same story with different characters; she has a unique ability to cross every genre from light-hearted romance to heart-racing suspense to keep her readers entertained and inspired. This talented, intelligent writer is quickly becoming women’s favorite new author. Her books have been finalists in several independent competitions including the 2010 National Indie Excellence Awards and the 2009 IPPY Awards. Becky Due, like the main characters of her novels, spent many years running from her life, looking for love, crying a little and laughing a lot along the journey of finding herself. Through writing, she found her passion and is currently working on her next novel. 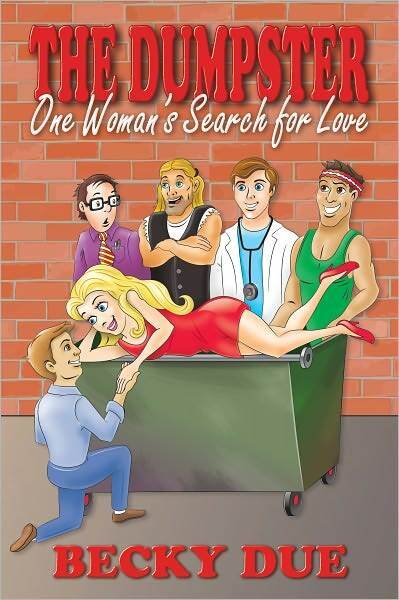 Becky’s latest book a contemporary romance titled The Dumpster: One Woman’s Search for Love. Visit Becky Due on the web at www.BeckyDue.com. Thank you for this interview, Becky. Can we start out by having you tell us briefly what your new book is about? The Dumpster: One Woman’s Search for Love is a Contemporary Romance Novel set in Miami, Florida about Nicole, a cute, chubby, twenty-something woman, who is looking for love in all the wrong places. Who would have guessed that a dumpster in the back alley below her bedroom window would hold the key to finding love? I love working with Pump Up Your Book Virtual Book Tours. This is my second tour and I’m already looking forward to my third. This virtual book tour is easy and the payoff is worth the investment. The book tour gives me many reviews, lot’s of interviews and recognition, and a great book trailer that I can use to continue promoting my book even after the tour is over. Is this the first time you have heard of them? If not, where did you hear of them? I kept hearing about the virtual book tour on the Internet and after digging around and doing a little research, the virtual book tour sounded like the perfect fit for me. As you know, a virtual book tour involves – among other things – interviews and guest posts. Do you prefer one over the other? No, I think the variety is good for both the author and the sites. I enjoy doing both. Some authors prefer an all review tour. Can you tell us if you are one of them and why or why not? That sounds very nice. I would like that, but having done one virtual book tour already, I learned that my readers enjoyed hearing from me, learning more about me, the author. Giving fans more than just a review is important to me. Most importantly, awareness that I have a new book out and it’s available today. I don’t want my readers to lose track of me as an author. Yes, I have a website and blog. I use facebook, twitter, MySpace, Goodreads and a few others. I maintain my own website and blog. I used to have a company maintain my site but I like to update and make changes often so it was ridiculously expensive. I had to find a new way so I found a company that makes it very easy for the average person. I love working on my own website; I make changes and updates almost weekly. What are your experiences with offline book signings? Do you have much luck selling your book through that method? I’ve had the good and I’ve had the bad. I’ve taken a break from the in store book signings but I will probably give it another shot within the next year, especially if The Dumpster does well. Probably the same way I am now. I’ve been told that I’m running a marathon not a sprint. So, I’m just going to keep moving forward and writing great novels for women. But if money were no object, I’d let somebody take over the Internet marketing and promotion and everything else that keeps me from writing my books. Thank you for this interview, Becky. Do you have any final words?